Model Number:A1398. 512GB Flash Storage. This is the best Apple designed laptop period. The reason is elegant and streamlined design, better keyboard, essential ports (including 2xUSB 3.0 ports HDMI port SD Card reader port etc). The Apple MacBook Pro laptop, released in 2015, renders performance and multi-tasking efficiencies with the integrated 16 GB RAM. This device is powered by a reliable Core i7 2.5 GHz processor. The 500 hard drive provides storage space for digital content. This Apple notebook features a convenient 15.4" display. 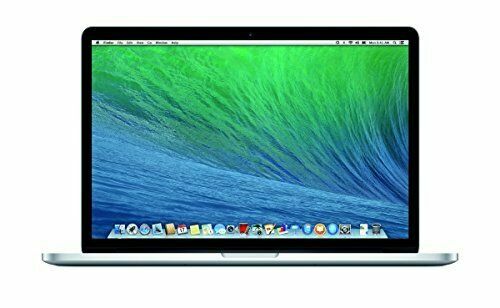 item 4 Apple MacBook Pro 2015 A1398 MJLT2LL/A i7 2.50GHZ 16GB 512GB SSD 15" -Apple MacBook Pro 2015 A1398 MJLT2LL/A i7 2.50GHZ 16GB 512GB SSD 15"
I use it for both Mac and Windows operating systems, four cores i7, 16GB RAM, light and portable. This Mid 2015 Macbook Pro is a great upgrade from my old Mid 2009 model. It came preinstalled with a clean OSX Sierra. The only "weird" thing was that the 500GB SSD drive was not partitioned to the full 500GB, but only 420GB or so. So had to re-partition and reinstall OSX. Still 5 stars though. While newer models may have a touch more power, this model still has plenty of oomph at a greatly reduced $cost. It may not have the latest in touch bar and USB C ports, but it's got plenty of the older ports for connecting all those legacy devices still laying around. I'm very happy with it. Another win for a used MBP!